Within nine hours of operation, India’s first space telescope, Astrosat, provided a deep insight into a blackhole mystery puzzling astronomers for over a decade. The US, Japan, Russia and Europe have their own observatories in space. With Astrosat, a new era has begun for Indian science. This will enable India to undertake world-class research in science. About 40,000 light years away, in the direction of the constellation of Aquila, is an exotic stellar formation. Named GRS 1915+105 by astronomers, this bizarre binary stellar formation consists of an ordinary star waltzing around a compact massive black hole. This mighty black hole strips matter from the companion star, which swirls around it forming an accretion disc. As the disc rapidly whirls around the black hole, temperature increases up to as high as 10 million degrees, resulting in the emission of several types of high-energy rays. The total power coming out of the system is often more than 10,000 times that of the sun. American satellite, The Rossi X-ray Timing Explorer, had found that X-ray emissions from this enigmatic black hole system oscillates nearly periodically on a time scale of just a few hundred milliseconds using its low energy X-ray detector. It is like a flickering candle. The Large Area X-ray Proportional Counter (LAXPC) on board the Astrosat was able to observe this mysterious object using high-energy X-rays, enabling astronomers to peep deep into mysterious black holes. Usually, higher-energy photons such as high-energy X-rays are emitted closer to black holes than low-energy photons. Hence, studying them would provide us with an insight into the dynamics of black holes. Astronomers believe that these oscillations occur as the inner part of the disk surrounding black hole wobbles as the spinning object drags the space-time fabric around it as predicted by Einstein’s General theory of relativity. By studying the high-energy X-rays, astronomers are able to deduce the intrinsic spin of black holes. Interestingly, this discovery was made in nine hours after Astrosat was operational by J S Yadav and his colleagues from the Tata Institute of Fundamental Research (TIFR), Inter-University Centre for Astronomy and Astrophysics, University of Mumbai and the Raman Research Institute. The report was later published in the prestigious Astrophysical Journal. If LAXPC has detected highly variable X-ray behaviour of a compact binary system in a short space of time, the Ultra-Violet Imaging Telescope ((UVIT) on board Astrosat has successfully solved the mystery of a red star in the NGC 188 cluster. Astronomers know that red stars such as Betelgeuse (Ardra) are cool stars while bright blue stars such as Pleiades (Krithika) are hot. One star in NGC 188 was, however, baffling scientists as it was red in visible light but dazzled brightly in UV telescope images. This “sub-dwarf” class star was a mystery right from its detection in 1995. Indian scientists examined it carefully. The Astrosat UVIT telescope revealed that this star is actually a binary system, consisting of one hot star and another cool one. The Cadmium Zinc Telluride Imager (CZT) of Astrosat on its very first day of operation detected an enigmatic long-duration gamma-ray burst (GRB), namely GRB 151006A. The CZT Imager identifies Compton-scattered events, thereby providing polarisation information for bright GRBs. In spite of GRB 151006A being faint, the CZTI could for the first time shows hints of a polarisation signal at 100-300 keV. Indeed, there are far more powerful X-ray and UV space telescopes than the Astrosat orbiting the Earth. 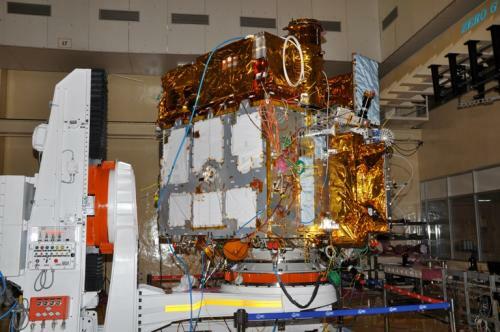 However, it is only the Astrosat’s three units of LAXPC, made indigenously by scientists of TIFR and having an effective area of 8,000 cm square, have the requisite sensitivity and sophistication to detect high energy X-rays and measure the arrival time difference between high-and low-energy X-rays, which are just in the order of tens of milliseconds. Further, as the various detectors could simultaneously capture X-ray data from 0.3 keV to about 100 keV range from a particular source, variation in emissions could be better characterised. These measurements provide direct clues to the geometry and dynamic behaviour of the gas swirling around a spinning black hole. Further, until now the space telescopes have been providing only a narrow band wavelength such as X-rays or ultraviolet rays. NASA’s Hubble Telescope provides data on the visible range while the Chandra observatory is limited to X-rays. In contrast, Astrosat would be a multi-wavelength space telescope, providing combined visible ultraviolet and low-and high-energy X-ray wavelengths of the electromagnetic spectrum. Augmented with ground-based observatories and coordinated with other space telescopes, Astrosat’s power can be multiplied. While the stars are placid, usually they radiate only in visible light. In their exciting phase of stellar life (when they are young) or they explode into white dwarf or exotic celestial objects such as accreting magnetic white dwarfs, supernova remnants, X-ray binaries with accreting neutron stars and black holes, active galactic nuclei and clusters of galaxies and so on, they emit in wavelengths other than visible light. Our terrestrial-based telescopes telescopes are not able to observe these events. While visible light from stars and outer reaches of the universe reach the surface of the Earth, our atmosphere is opaque to many types of radiation such as gamma rays, UV rays and X-rays. Thus, space telescopes are a must to capture the vibrant universe. 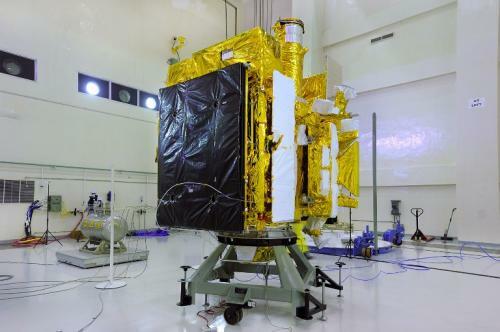 Astrosat is a 1,515 kg IRS-class satellite that was placed in orbit by ISRO's PSLC C30-XL rocket on September 28, 2016. After initiating orbit stabilisation at an altitude of 650 km above the surface of the Earth and near equatorial orbit with an inclination of six degrees, and the scientific payloads Ultraviolet Imaging Telescope (UVIT), LAXPC, Soft X-ray Telescope, CZTI, Scanning Sky Monitor (SSM) and Charged Particle Monitor(CPM) were calibrated one by one before the space telescope was commissioned. After careful performance verification of the instruments on board Astrosat, the space telescope became fully operational on October 5, 2016 and is expected to have a lifespan of five years. The 3-in-1 ultraviolet imaging telescope can also collect data in the visible range as well as far and near UV range. This state-of-art instrument can detect the arrival of a photon with an accuracy of five milliseconds. The X-ray telescopes, Soft X-ray SXT and LAXPC put together, can detect X-rays in the range of 0.3 to 100 keV. Scanning sky monitor can watch the sky for any transient behaviour of X-ray sources and alert astronomers of any sudden and violent events such as the birth of a black hole. Placing an X-ray telescope and operating it in space is not an easy task. Sun is a brilliant X-ray source and in comparison the rest of the X-ray sources are typically 1,000- to 100,000 times fainter, making the task of observing an X-ray source akin to watching stars in full daylight. The emission from even the brightest X-ray source, ScoX-1, is just 100 photons per seconds in one sq cm area. The typical heavenly X-ray source is just one millionth bright. This implies that the instruments have to be very sensitive to capture such a low intensity. Black holes and compact binaries are not the only X-ray sources in the sky. Hence, it is imperative to separate out the background noise from the true signals from the stellar objects. The mission is further complicated by the presence of electrically-charged particles in the upper layers of Earth’s atmosphere. The solar wind carries charged particles that form into a belt around the Earth, mainly in two regions. Called Van Allan belt, the inner belt is between 1,000 to 6,000 km and the outer belt extends from 13,000 to 60,000 km. The detectors, SSM and LAXPC, would be affected by the charged particles and data would be marred. To secure error-free data and to prevent damage to the instrumentation by intense radiation, they had to be shut down and operated only when conduction is suitable. The Charge Particle Counter, aboard the telescope, counts the ambient charge particles and takes preventive and corrective steps. Like any long march, this project also commenced with a modest meeting of heads way back in 1996. About 50 astronomers from around the country met and deliberated on the need for a dedicated Indian space telescope. Indeed, the very first Indian satellite Aryabhata launched with the help of Soviets in 1975 had an X-ray detector. Including the Indian Cosmic Ray experiment, Anuradha, aboard space shuttle spacelab-3, Indian scientists have designed, built and flown many astronomical payloads. Taking the next logical step, Indian astronomers, prepared the Astrosat science plan in 2000. The ambitious mission which is expected to last for five years opens up new vistas for Indian astronomy. With sophisticated data from space, India can study and explore mysterious phenomena like black holes, neutron stars quasars and pulsars as well as study the life and death of stars.